Wyoming and Colorado State kicked off the week in their annual Border War game. The Border War, for those of you who don’t know, has been played for a REALLY long time and they play for a trophy called the Bronze Boot. The Cowboys had won the previous four meetings before this weekend, however, it was Colorado State who would get the last laugh this weekend. The Cowboys got down early to the Rams and they never let off the gas from there. Rams running back Kapri Bibbs went beastmode and went for 201 yards and 3 scores to lead the Rams. They obviously found a problem with the Wyoming rush defense. Brett Smith, who ranked 3rd in the nation in total yards per game, had a very poor game throwing for 246 with a pair of INTs while only rushing for 12 yards on 11 attempts. The Cowboy offense never managed to get going in this one. Lethargic might be an appropriate team, actually. Colorado State also dominated the time of possession, holding it for almost 11 minutes more than the Cowboys. Colorado State will head to Hawaii next, the Cowboys will head to San Jose to take on the Spartans. Nevada and their Wolf Pack (two words) rolled into Boise with upset on their mind. The Wolf Pack got up to a 17-7 lead on the Broncos to end the first half. Wolf Pack running back Kendall Brock accounted for one of those touchdowns, Don Jackson accounting for the other. Joe Southwick was lost very early in this game with what appears to be a season ending broken ankle. Southwick was hurt on his only rush of the night along the sidelines. In his absence Grant Hedrick replaced him and did a good job. Hedrick threw for 150 yards and an INT, but also rushed for 115 yards and two scores. On the other side of the ball Cody Fajardo had an efficient night, but failed to produce any scores for the Wolf Pack. Jay Ajayi took over the second half and rushed for 222 yards and 3 scores, effectively ending Nevada’s upset bid. Nevada will play in their rivalry game against UNLV this coming weekend, while Boise State will play a Friday night ESPN game at BYU. Utah State thought their season was in big trouble when Charles F. Keeton went down but it appears that they’re not quite finished yet. Freshman quarterback Darell Garretson has stepped in to replace Keeton this week and had a fine week. He threw for 144 yards and a score. Running back Joey DeMartino did much of the heavy lifting for the Aggies who rushed for 144 yards and three scores on their way to abusing New Mexico. The Lobos rushing attack was mostly negated by the Aggies. Kasey Carrier rushed for only 69 yards, a disappointing performance for him, while Cole Gautsche was held to 7 yards and 34 yards through the air. Mostly just a terrible night for the Lobos offensively. Utah State will be on bye next week, as will the Lobos. In the Mountain West night cap the UNLV Rebels and their four game winning streak took their talents to Fresno to play with Derek (not David) Carr and the Bulldogs. The Rebels found out that they’re the Rebels and were abused by Carr and the Bulldogs. The Bulldogs ran up 641 yards of offense while the Rebels watched their winning streak come to an end. Derek Carr had a nearly flawless game going for 412 yards and four scores. Even the Bulldogs rushing attack showed up for this game by going for a combined 206 yards behind Marteze Waller and Josh Quezada. The Rebels have relied on senior Caleb Herring this season to fuel this winning streak but he didn’t have the magic this week, throwing for only 161 yards and a score late in the game. Shaquille (not 7 foot) Murray-Lawrence rushed for 79 yards and a score for the Rebels. UNLV will play Nevada next in the battle for the Fremont Cannon. 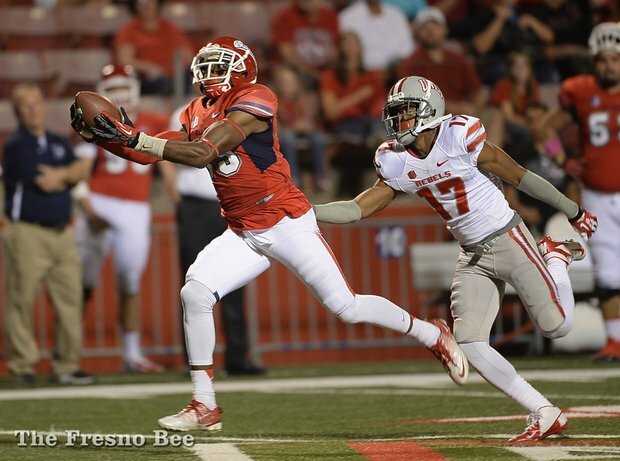 Fresno State will head to San Diego State to take on the Aztecs. Wyoming had a trouble loss this week to Colorado State, a team that thought it had a shot at the Mountain division crown. Boise State will be interesting to watch with Southwick going down for the year and Hedrick taking over. How will that change their offense? Fresno State just keeps on rolling, this week they’ll have a bigger challenge with San Diego State, their last hurdle on the way to the Mountain West title game. This week the Bulldogs check in at 15th in the AP and ahead of Northern Illinois in the BCS rankings. Still tough to see where Utah State is without Keeton, but it appears there’s a glimmer of hope in Logan. This weekend has a couple of interesting games, first being Boise and BYU.. should be a great game, both teams are trying to claw their way into the top 25, and I think the winner may get very close next week. Notre Dame is traveling to Air Force presumably to have some sore knees and beat on the Falcons. Though, don’t count out AFA, they always seem to get up for these big opponent games, especially at home. The Fremont Cannon game in Nevada will be fun, the Rebels are obviously better this year and Nevada is looking pretty good again with Cody Fajardo getting back to normal. This week’s pillow fight goes to Colorado State and Hawaii.. mostly because it’s Hawaii and we get to hear some Robert Kekuala call some Hawaii football!